Although it is still a Top Safety Pick, the 2014 Toyota Corolla could have done better on this stringent test. 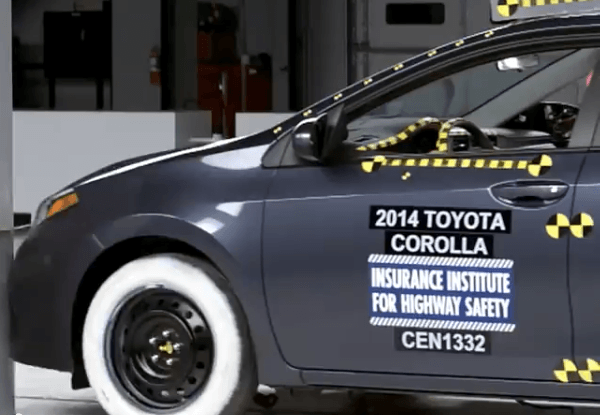 The 2014 Toyota Corolla was tested by the Insurance Institute for Highway Safety (IIHS) in the new small frontal overlap test this month. Although its score was rated marginal, the Corolla did better than many vehicles have of late in this difficult test. The Toyota Corolla will remain a Top Safety Pick. The new small frontal overlap test was added last year. At the time of the test’s introduction many people were surprised that luxury cars and larger vehicles were being rated “poor.” Since then, only a small percentage of automakers have had multiple models with good ratings. The test is difficult for many automakers because their designs were too far along in the cycle to accommodate changes that would allow for a good result on the test. One notable small car that did rate “good” on the small frontal overlap test, and thus was awarded a Top Safety Pick + rating, was the Corolla’s arch nemesis the Honda Civic.